Truck collisions can have numerous causes, and multiple parties may be held liable for the resulting injuries and property damage. The driver. As with all other motorists, truck operators are required to comply with traffic laws and exercise a duty of care toward everyone else on the road. Operators can make many mistakes that lead to severe collisions, including speeding, distracted driving, fatigued driving, and alcohol or drug use. While the man or woman behind the wheel will almost certainly be included on the list of responsible parties in a truck collision, he or she is rarely the only liable party. The driver’s employer. 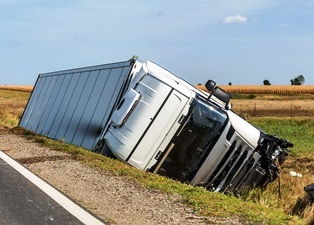 Trucking companies are often held responsible for damages sustained during a commercial vehicle accident. Since the truck driver is an agent of the company he works for, the fleet company or retailer can be held liable for failure to properly train and manage the driver. Vehicle and parts manufacturers. Manufacturing defects can contribute to a truck collision. If a manufacturer is guilty of producing a faulty vehicle or part, it can be held liable for any resulting accidents. The maintenance provider. If a third party is responsible for truck maintenance, this organization may be liable if the accident was caused by a lack of proper maintenance or repairs. State and local governments. Poor design or maintenance of the road can lead to serious truck accidents. State and municipal governments are obligated to provide safe roads. When they fail to do so, the truck accident victim can hold government entities liable for the resulting injuries. If you were injured in a truck accident, multiple parties may be liable for the harm you’ve suffered. An experienced vehicle accident attorney can help you identify those responsible for your collision, and ensure you receive proper compensation. To learn more about what the law offices of Steve M. Lee, P.C., can do for you, visit us on Facebook. How Do I Prove My Truck Injury Claim?